Award-winning French comics writer and artist Richard Marazano has united with relatively unknown Chinese animator and illustrator Luo Yin to produce a lyrical, mysterious children’s story based on a Chinese fable but reminiscent of Japanese-produced Studio Ghibli films. 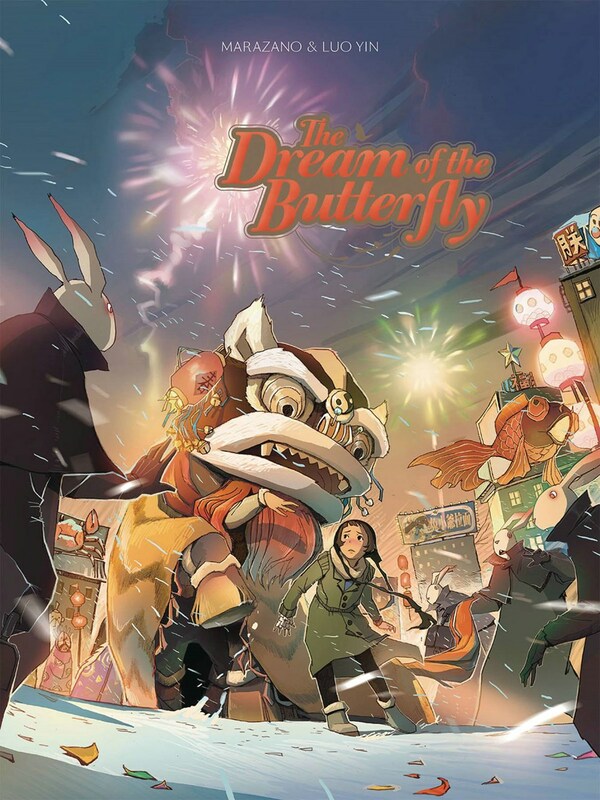 In The Dream of the Butterfly, Vol. 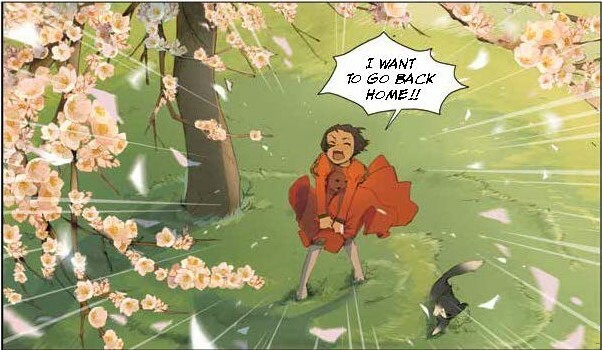 1: Rabbits on the Moon, Marazano, an experienced writer of comics for young readers, follows the cardinal rule of children’s adventure stories: get rid of the adults as fast as possible and throw the child protagonist immediately into unfamiliar circumstances from which there seems no possible return. Tutu resides at a boarding school in the mountains. She is thrilled to find that the rest of the students have gone on a field trip, leaving her with a whole day to herself, and she sneaks past the kitchen staff to explore the snow-covered landscape alone. Unfortunately (and predictably? ), a blizzard blows in and disorients Tutu. She wanders into a smoggy, industrial city where she seems at first to be the only human. Populated almost entirely by talking animals—most of them sized like adult humans—the city has a set of laws everyone expects Tutu to know. Of course, she doesn’t, so just being herself gets her into trouble with the secret police, who are a cadre of visually interchangeable, somewhat daft rabbits in trench coats. The rabbits bring Tutu to the attention of the city’s emperor, who appears in public only via a series of creaky robotic avatars that always seem on the verge of collapse. The emperor says he’ll help Tutu if she brings him something that seems unobtainable in that wintry, smoke-hazed world: one particular, special butterfly. Alternately aided and hampered in her efforts to return home by a coalition of underground resistance activists made up of a regular-sized cat, an enigmatic aviator swathed in scarves, and a small group of other illegal children, Tutu struggles with the overwhelming lack of anything familiar and cannot make sense of her recurring dreams of springtime . . . and a multitude of butterflies. Interior art. Lion Forge Comics. Luo Yin’s illustrations are a more angular, rough-edged version of the wistful style we associate with Studio Ghibli, to which the artist has no connection. And if you like being dropped willy-nilly into a fully imagined world in which an intrepid young girl is left to figure out what the heck is going on (and maybe save the world) all on her own, as is typical of Ghibli films, you’ll thoroughly enjoy this story. The Dream of the Butterfly was originally published in French in 2010 as Le Rêve du Papillon and was nominated for the Angoulême Festival Youth Prize; I found the three additional Papillon volumes for sale on Amazon.fr, so expect translations of those to follow. With subtitles like Dreaming a Revolution (which comes out in July 2018) and The Hamster in Spring (whose actual English-translation subtitle may be different), volumes 2 through 4 promise lots more quirky, child-friendly adventure. I’m going to get all pedantic here and point out that this French-Chinese collaboration echoes the historical development of modern animation in China. While shadow and zoetrope drama have been part of Chinese culture for centuries, contemporary techniques in animation began in France and later spread to China, where the industry flourished until the Cultural Revolution resulted in the persecution and “reeducation” of such artists, leaving Japan to dominate Asian and world markets for decades. Richard Marazano’s and Luo Yin’s work may be a stylistic homage to the juggernaut that is Studio Ghibli, but I’m hoping later volumes reflect the sensibility of the original fable, which is attributed to one of the great Taoist philosophers, Chuang Tzu. Since the butterfly parable’s true meaning is still debated (as it is here), this creative duo has a lot of leeway. Timnah wants to know how everything works. Then she wants to tell you about it. Can’t Wait for More Rick and Morty Episodes? Check Out the Comic! Is Black Label a Black Eye or a Game Changer for DC Comics?